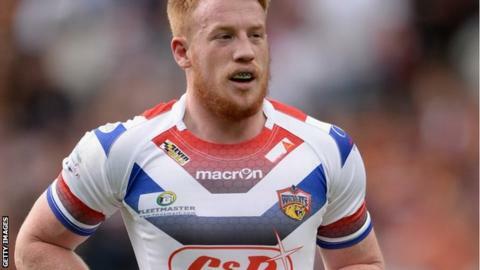 Wakefield Trinity Wildcats kept their slim hopes of reaching the play-offs alive with an easy win over Salford. Andy Raleigh, Danny Washbrook and Chris Riley touched down for the home side in the opening 20 minutes. Harrison Hansen gave Salford some hope after the break, but Dean Collis and Ali Lauitiiti soon crossed for the Wildcats to widen the deficit. Richard Owen went over twice either side of Pita Godinet's score to wrap up the victory. "We didn't turn up and you can't do that playing in a Salford shirt any more. There is accountability for representing Salford and we completely fell below that today. It's about us fixing that in the last two games of the season because it's not acceptable." Defeat for Salford meant they can no longer reach the top eight, regardless of their last two results. The Wildcats still have an outside chance of taking eighth spot, but must win their last two games by a significant margin and hope Widnes lose both of theirs. The hosts made a bright start and Raleigh touched down for his first try of the season from Washbrook's pass before the forward went over himself from a Tim Smith grubber kick. Riley extended the lead from a Paul McShane kick, Paul Sykes landing the second of his three goals to make it 16-0 at the break. Tony Puletua fed Hansen to charge in from 50 metres out after the interval to give Salford their first score. Any hope of a comeback was short-lived though, with first Collis and then Lauitiiti powering over for Wakefield. The hosts finished in dominant fashion with Owen touching down from a Collis flick-pass and getting his second after Sykes kicked a 40-20 either side of Godinet getting his hand on McShane's kick through. "Our home form has been outstanding. "I thought our boys turned up in a great state of mind. "Salford have been going great guns over the last two months and we knew we had to play well to win." "It was a big game for us, a big game for the club. The game is about attitude and a want and a desire and we didn't have that. We'll get to bottom of that. "We came up against a side that hit harder and ran harder than us. You can break the game down as technically as you want, but if you have a team that wants it more than you, you are going to come up second best." Wakefield: Sykes, Owen, Collis, Lyne, Riley, Godinet, T. Smith, Anderson, McShane, Raleigh, Gilmour, Molloy, Washbrook, Wildie, D. Smith. Replacements: D. Smith for Anderson (26), Wildie for McShane (30), Tautai for Raleigh (26), Raleigh for Gilmour (45), Lauitiiti for Molloy (30), McShane for Wildie (59), Molloy for D. Smith (54). Salford: Locke, Johnson, Sa'u, Caton-Brown, Evalds, Chase, Fages, Morley, Lee, Tasi, Hansen, Ashurst, J. Walne, Dixon, Tomkins. Replacements: Dixon for Morley (36), Tomkins for Lee (36), D. Griffin for Tasi (26), J. Walne for Ashurst (59), Puletua for J. Walne (26), Morley for Dixon (59), Lee for Tomkins (65).